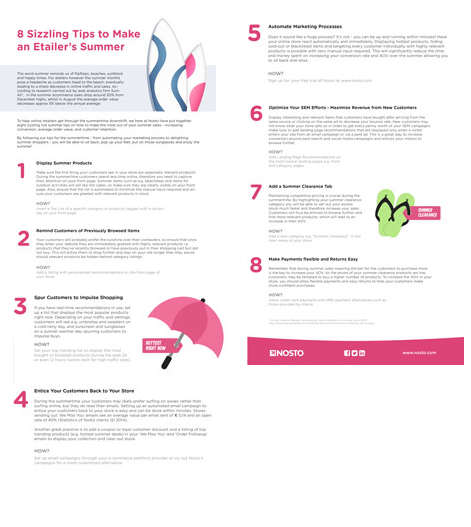 By following these 8 tips for the summertime – from automating your marketing process to delighting summer shoppers – you will be able to sit back, pop up your feet, put those sunglasses on and enjoy the summer! The word summer reminds us of flipflops, beaches, sunblock and happy times. For etailers however the summer months pose a headache as customers head to the beach, eventually leading to a sharp decrease in online traffic and sales. According to research carried out by web analytics firm SumAll, in the summer ecommerce sales drop around 30% from December highs, whilst in August the average order value decreases approx 5% below the annual average. To help online retailers get through the summertime downshift, we here at Nosto have put together eight sizzling hot summer tips on how to make the most out of your summer sales – increasing conversion, average order value, and customer retention. By following our tips for the summertime – from automating your marketing process to delighting summer shoppers – you will be able to sit back, pop up your feet, put on those sunglasses and enjoy the summer!